(January 29, 2019) Naymote Partners for Democratic Development releases its one year report on the President Meter Project. The President Meter is an independent monitoring tool that enables Liberians and civil society actors to evaluate the performance of President George Manneh Weah and the Coalition for Democratic Change against promises made during and after the election. The overarching objectives of the President Meter Project are to promote democratic accountability, improve government’s performance and strengthen public service delivery. This report focuses on promises contained in the CDC’S Manifesto, Presidential Priority Projects, Campaign Speeches and Policy Statements made since President Weah inauguration on January 22, 2018. Naymote Executive Director, Mr. Eddie D. Jarwolo believe that the President Meter Project is the best platform to promote democratic accountability and make elected officials more accessible, accountable and responsive to their constituents thereby building citizens trust in elections and democratic processes. He hopes this report will be taken in good faith and more actions will be taken by the Government to deliver on ongoing promises within the second year in office. He calls on citizens to hold their elected officials accountable to deliver on the campaign promises made during the election. The project is supported by the Open Society Initiative for West Africa (OSIWA). 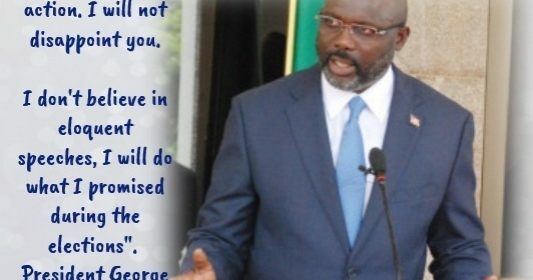 Click link to download/ read the One Year Report On President Weah Performance 2019.